Homeowners can end up with beautiful basements when the remodeling process is handled with care. Homeowners tend to approach the independently owned and operated basement renovation experts at Total Basement Finishing (TBF) with two primary needs: finishing the basement and remodeling the basement. More often than not these days, it seems like they're talking about a basement remodeling or renovation project. What's the difference? When a basement is finished, a stark, bare area is transformed into a beautiful finished basement. The construction of the area is planned, rooms are designed, and finishing options are carefully reviewed. The homeowners are choosing how their beautiful new living space will be designed and are often adding additional living space to make room for a growing family. Another common concern is whether or not a "green basement finishing project" is an environmentally sound choice. 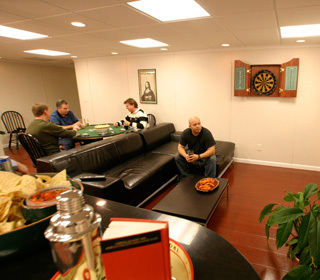 Total Basement Finishing can ease your mind and create the perfect remodeled basement based on your design ideas. Our dealers are trained and certified to use our proven products to the best of their ability, giving your home added comfort and value. 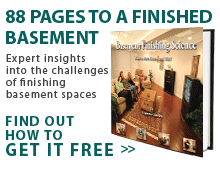 Schedule a free estimate for basement remodeling in your area! Many times a homeowner decides to remodel a basement only when the basement environment has become so intolerable that they can no longer stand to live with it. With many common basement finishing materials used on the market, (such as drywall, mold-resistant drywall, wood, carpeting) moisture can run a tremendously damaging course, eventually ruining the finished area. The cost of basement finishing with these methods is multiplied many times by having to replace and repair something that should last! If you're using traditional drywall, carpet on concrete, wood studs, and other organic material in your basement, you are really creating a future home remodeling project. If the basement is finished with products containing any organic materials at all, they're going to be susceptible to mold, mildew, rot, and dust mite damage. As these products decay, they begin to release moldy, musty odors into the air, making the area an unpleasant environment to live in. These odors can spread throughout the entire home, adding allergens and adding to discomfort. Homeowners generally get fed up with the situation over time and decide to remove and replace the offending materials. If you're finishing the basement, don't turn the space into an expensive basement remodeling or renovation project farther down the line. Find quality inorganic materials with a written warranty that is provided by a national network of basement renovation experts. If you finish the area with the best basement finishing products the first time, you can have a remodeled basement that comes with a written warranty assuring that your basement will look beautiful for a long, long time! Start here to begin your basement remodeling plans. Also use our basement remodeling ideas and check out our finished basement pictures featuring the TBF system and the many combinations and varieties of our products and room designs. We have helped thousands of homeowners from Omaha to Yonkers.